[M. x soulangeana], cv. (Pickard, Magnolia Gardens List, p. 9. 1970, Canterbury, Kent, England) = M. Stellatax cv. George Henry Kern. [M. liliiflora, M. sprengeri], cv. (Magnolia 20(1) [Issue 37]: 16, 1984). ‘An upright single stemmed plant of pyramidal habit. Flowers have 11-12 tepals arranged in whorls of 4. They are red-purple at the base, and open sufficiently late in the spring to avoid frost damage. Hardy to Zone 4A.’ Registered by F. S. Santamour, Jr., U.S. National Arboretum, Washington, D.C. (Hortscience 15(6): 832, 1980). (M. liliiflora cv. Nigra x M. sprengeri cv. Diva). [M. grandiflora], cv. (Koch, Dendrologie 1: 368. 1869) = cv. Galissonniere. [M. grandiflora], cv. (Mottet in Nicholson, Dict. Prat. Hort. Jard. 3: 232, T. 35, fig. 1. 1895) = cv. Galissonniere. [M. grandiflora], cv. (Kelsey & Dayton, Stand. Pl. Names, Ed. 2, p. 376. 1942), per synonymy = cv. Galissonniere. [M. x soulangeana], cv. (M. P. Borlase, Rhod. with Cam. & Mag. 41: 61. 1988). Nomen nudum. = M. x soulangeana cv. Pickard's Garnet. [M. sieboldii], cv. (Magnolia 25(1) [Issue 47]: 19, 1989). 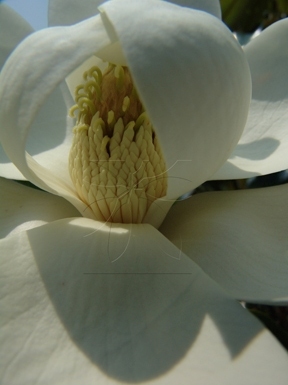 ‘Tetraploid form of the species with pure white, typically sized flowers, and red stamens twice the normal size; seeds also twice normal size.’ Described but not named in Magnolia 20(2): 8, 1985. Registered by A. E. Kehr, 240 Tranquillity Place, Hendersonville, North Carolina 28739. [M. stellata, (unknown)], cv. (Carl E. Kern, Wyoming Nurseries, Cincinnati, Ohio), U. S. Plant Patent #820, granted on 11 January 1949, per Amer. 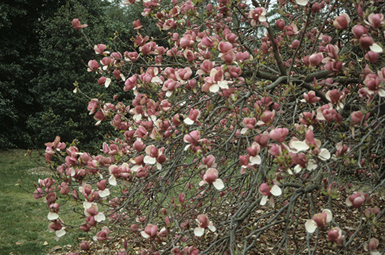 Nurseryman 89 (5): (1949), see Kammerer, Morton Arb. Bull. 27: 21 (1952). 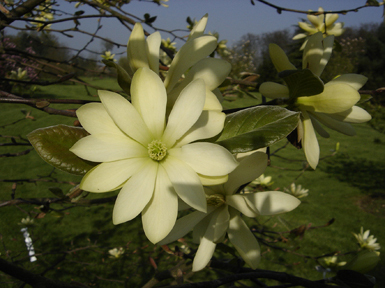 see Wyman, Arnoldia 20: 27 (1960), ‘with us, this does not have as large flowers as some of the other varieties.’ per conversation of Carl Kern, Sr. with J. C. McDaniel in 1961, was raised from seed of M. stellata, so is excluded from M. x soulangeana. = M. x cv. George Henry Kern. [M. grandiflora], cv. (Benary, Prix-Courant des Graines pour Marchands, p. 49. 1893, Erfurt, Germany), ex Pampanini, Bull. Soc. Tosc. Ort.41: 102 (1916). nomen nudum. [M. grandiflora], cv. (Cels, Cat. Arb. p. 23. 1817, Paris, France), as a species. In Pampanini, Bull. Soc. Tosc. Ort.41: 102 (1916), leaves totally glabrous. [M. grandiflora], cv. (Baumann, Cat. p. 26. 1842, Bollwiller & Mulhouse, France), nomen nudum. [M. virginiana], var. (Linnaeus, Sp. Pl. 535. 1753) = var. virginiana. [M. grandiflora], cv. (Orr & Furuta, Highlights of Agricultural Research 10 (3), Fall 1963, Auburn, Alabama), nomen nudum, but illustrated by photos. = cv. Saint Mary. [M. denudata], cv. (Pampanini. Bull. Soc. Tosc. Ort.40: 200. 1915), flowers brief and globose. syn. : M. yulan var. globosa. [M. globosa], var. - The typical variety. [M. x soulangeana], cv. (Hort. ex Pampanini, Bull. Soc. Tosc. Ort.40: 217. 1915), in synonymy = cv. Globuliflora. [M. x soulangeana], cv. (Longone Nursery Cat. 75: 38. 1889, Milan, Italy), per Pampanini, Bull. Soc. Tosc. Ort.40: 217 (1915), flowers very brief, globose. syn. : M. globularis (Longone, Cat. 75: 70. 1889), per Pampanini, op. cit. 41: 187 (1916); M. x soulangeana cv. Globulifera (Pampanini, op. cit. 40: 217. 1915). [M. grandiflora], cv. (Kelsey & Dayton, Stand. Pl. Names, Ed. 2, P. 376. 1942), per synonymy = cv. Gloriosa. [M. x brooklynensis, M. acuminata, M. denudata], cv. (Magnolia 28(1) [Issue 53]: 15, 1992). ‘This hybrid was created by August Kehr, Hendersonville, North Carolina, in 1984.... The hybrid first bloomed 7 years later. 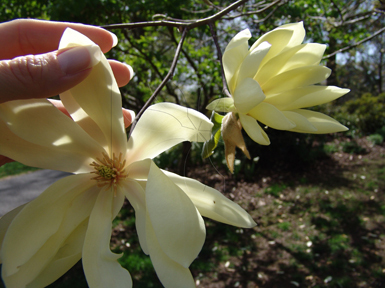 The flowers are 9-10 inches in diameter, have 8-9 tepals of a deep yellow color (deeper than that of ‘Sundance’ or ‘Elizabeth'). The plant is upright in habit, blooms late in the flowering season. Zone 5(4).’ (M. x brooklynensis cv. Woodsman x M. cv. Sundance). [M. acuminata, M. denudata, M. x soulangeana], cv. (Fairweather Gardens Nursery catalog, p. 62, Fall 1999). ‘Very heavily textured flowers of deep yellow which are unique because the flowers are cup shaped. Late blooming. Also unique is the distinctive, thick, wrinkled foliage due to its high chromosone number.’ =R18-27 (M. x soulangeana cv Lennei x M. cv Elizabeth). [M. acuminata subsp. subcordata, M. acuminata, M. denudata], cv. (Magnolia 33(1) [Issue 63]: 29, 1998). ‘This selection has 4 1/2 inch flowers of RHS 8B yellow with six tepals and a faint green flush at the base of the exterior surface of the tepals. Very floriferous. Many axillary flower buds and multiple terminal buds are produced, which open over a long period of time, providing a colorful display for up to four weeks. The plant is semi-dwarf, 6 1/2 feet tall at nine years of age. Hardy to at least –22°F. An introduction of the David G. Leach Research Station of The Holden Arboretum, David G. Leach, hybridizer. Named and registered by Leach in April, 1997.’ =M. acuminata var. subcordata cv Miss Honeybee x (M. acuminata x M. denudata). [M. acuminata], cv. 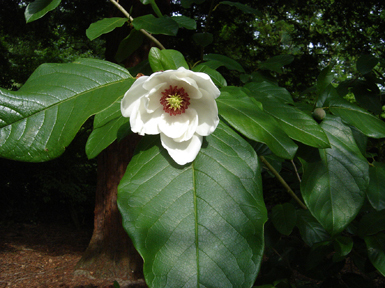 (Registered August, 1975 by Frank B. Galyon, M.D., 715 Walnut St., Knoxville, Tennessee), Clone discovered in 1957 in Great Smoky Mountains National Park (Sevier County, Tennessee), and first grafted that year by Ernest Iufer, Salem, Oregon, Tree typical M. acuminata, but flowers of golden yellow intermingled with green make it conspicuous. Clone of M. acuminata f. aurea. [M. acuminata subsp. subcordata, M. acuminata, M. denudata], cv. (Magnolia 33(1) [Issue 63]: 29, 1998). ‘Flowers of this selection are strongly yellow (RHS 10C) and 6 1/2 inches across. They are made up of 6 tepals of heavy substance which keep their tulip form until they drop. The tree is a symmetrical pyramidal grower with heavy foliage, 12 1/2 feet tall at nine years of age. Hardy to at least –22°F. 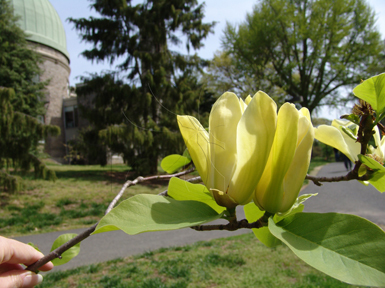 Blooms 10 days earlier than ‘Golden Sun.’ An introduction of the David G. Leach Research Station of the Holden Arboretum, David G. Leach, hybridizer. Named and registered by Leach, April, 1997.’ = M. acuminata var. subcordata cv Miss Honeybee x (M. acuminata x M. denudata). [M. acuminata x M. stellata 'Norman Gould'] cv. 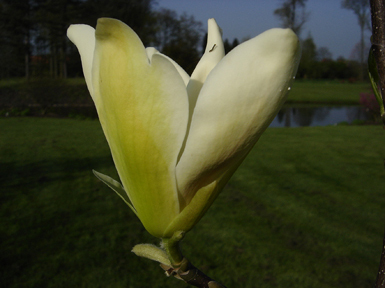 (Magnolia 36(2) [Issue 70]: 16, 2001) This fast growing tree produces medium-yellow flowers that cascade downward; the six tepals are very wide and cup-shaped; this hybrid has poor seed and moderate pollen fertility; registered in July 2001 by Dennis Ledvina. [M. acuminata, M. denudata], cv. (Magnolia 31(1) [Issue 59]: 17-18, 1996). 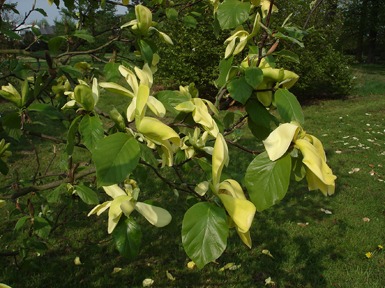 ‘This hybrid has strong yellow flowers (RHS 10C) with six tepals and heavy substance. The flowers open flat, seven inches in diameter, with prominent green calyces. The tree is floriferous and vigorous, eight feet tall with dense foliage at eight years from seed. 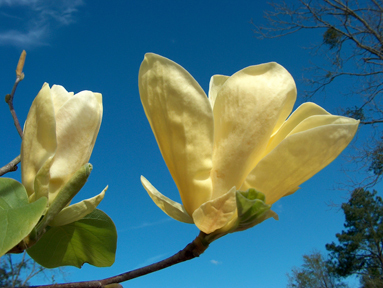 In northeastern Ohio, ‘Golden Sun’ blooms in mid-May before the leaves expand. 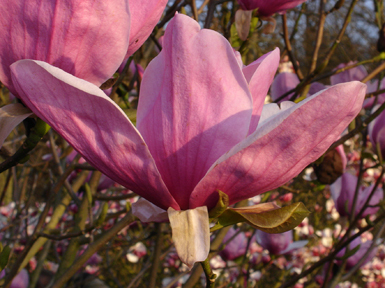 This cultivar was registered by Dr. David G. Leach, Madison, Ohio, and is a result of his breeding program there. Dr. Leach reports that he used superior forms of both parents in this cross.’ = M. acuminata x M. denudata. [M. acuminata subsp. subcordata, M. denudata], cv. (Magnolia 24(2) [Issue 46]: 8, 1989). ‘Very early light yellow flowers. Some leaves show with later flowers. Bloomed at four years from seed. Tall and graceful, single trunk habit.’ (M. acuminata var. subcordata [here, M. cordata] cv. Miss Honeybee x M. denudata cv. Sawada's Cream). [M. grandiflora], cv. (Newsl. Amer. Mag. Soc. 15(2) [Issue 28]: 20. 1979). Nomen nudum. [M. grandiflora], cv. (C. Smith, Caledonia Nursery, Isle of Guernsey. 1910), in Millais, Magnolias 140 (1927). leaves short, rounded, blunt at apex, light glossy green, smooth beneath; flowers very large and produced to November, See Gard. Chron. 148: 309 (1960). [M. virginiana], cv. (James Gordon, about 1750-1760, grown by Thompson, Mile End Nursery, England), in Sabine, Trans. Hort. Soc. London 3: 203 (1820), as Gordon's Double Swamp Magnolia. In Loudon, Hort. Brit. 226 (1830), as M. glauca cv. Gordoniana. Flowers double. Compare cv. Burchelliana and cv. Flore Pleno. [M. denudata], var. (Salisbury) Henry in Elwes & Henry, Trees Great Brit. Irel. 6: 1598. 1912). basionym: M. gracilis (Salisbury, Parad. Lond. 1: T. 87, (1807) = M. liliiflora cv. Gracilis. [M. denudata], f. (Salisbury) Schneider, Ill. Handb. Laubh. 1: 3300 1905), basionym: M. gracilise salisbury, Parad. Lond. 1: T. 87. (1807) = M. liliiflora cv. Gracilis. [M. liliiflora], cv. (Salisbury) Rehder in Bailey, Stand. Cycl. Hort. 1968. 1916). basionym: M. gracilis (Salisbury, Parad. Lond. T. 87 (1807), small shrub, branches slender, leaves narrow, flowers small, outside deep purple. [M. x soulangeana], cv. (= M. liliiflora cv. Gracilis). [M. grandiflora], var. - The typical variety. [M. grandiflora], cv. (Capacci, of Florence, Italy, circa 1871), per Pampanini, Bull. Soc. Tosc. Ort.41: T. 8 opposite p. 60 and p. 102. 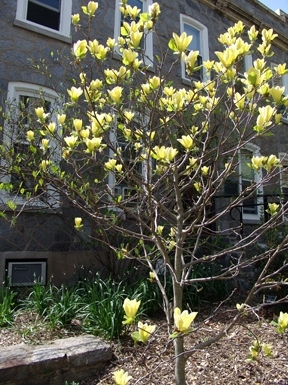 1916), branches persistent at base of trunk and often rooting, form columnar; leaves large, to 30 cm. long, 12 cm. wide, glabrescent. [M. denudata], cv. (Pampanini, Bull. Soc. Tosc. Ort.40: 200. 1915) = M. x soulangeana cv. Grandis. [M. precia], cv. (Rinz, Catalog 1860, Frankfurt am Main, Germany), ex Petzold & Kirchner, Arb. Muscav. 117 (1864), per synonymy = M. x soulangeana cv. Grandis. [M. x soulangeana], cv. (Bouche & Bouche, Blumenzucht 2: 719. 1855), flowers large, white, as M. yulan cv. Grandis. In Rinzi Gartenflora 5: 225, T. 166 (1856), flowers white, tepals 9, flushed red-purple along midrib beneath, especially towards the base. synonyms: M. grandis (Gard. Chron. N. S. 11: 725. 1879), nomen nudum. M. conspicua cv. Grandis (Mouillefert, Traite 119. 1891). [M. virginiana], cv. (Callaway, Dorothy, J. The World of Magnolias, p. 77, 1994). ‘Leaves and flowers larger than typical. Introduced by Louisiana Nursery, Opelousas, Louisiana.’ (M. virginiana var. virginiana). [M. acuminata var. subcordata 'Miss Honeybee' x M. 'Gold Crown'] cv. 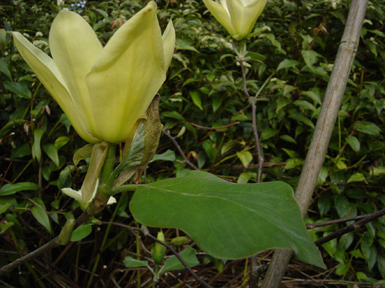 (Magnolia 38(2) [Issue 74]: 28, 2003) This upright, pyramidal hybrid produces yellow flowers just before or together with the first leaves; inner tepals are yellow (RHS 12C) on the outside with a greenish midrib; sometimes the outside is more completely yellow-green (RHS 145A-B); inner tepals deep yellow (RHS 11B) with the inner side an even yellow (RHS 11C) becoming paler toward the base; very young flower buds green (RHS 143B); stamens are pale, 1.2cm (0.47in) long; gynoecium is pale green and less than 2mm (0.08in) long; hybridized by Dr. August Kehr in 1991; raised, selected, and registered (August 14, 2002) by Philippe de Spoelberch and Koen Camelbeke of Arboretum Wespelaar. [(M. x brooklynensis 'Woodsman' x M. x soulangeana 'Lennei') x M. 'Elizabeth'] cv. 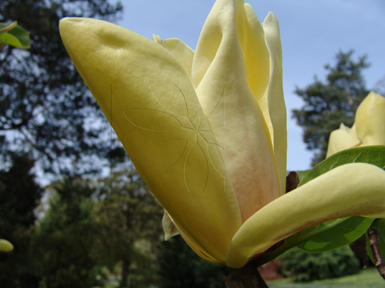 (Magnolia 36(2) [Issue 70]: 16-17, 2001) This later blooming sister seedling of 'Banana Split' is a vigorous tree that produces floppy flowers comprised of 8 or 9 tepals just before the leaves; tepals reach 20cm (7.9in); outer tepals are spotted green on both sides with a white background; middle tepals are pale white cream and inner tepals are white with a purple stripe on the outside and white within; hybridized by Dr. August Kehr; raised, selected and registered (2001) by Philippe de Spoelberch of Arboretum Wespelaar, Belgium. [M. virginiana], var. (Linnaeus, Sp. Pl. 536. 1753) = var. virginiana.